With temperatures continuing to creep up each summer and heat waves set to become harsher and more frequent, artificial cooling systems have become part and parcel of multi-residential living. Throw a stone at the pool of new developments being built today, and you’ll most likely hit one proudly marketing AC as part of its benefits. Some architects, however, are doing things counter-culturally. 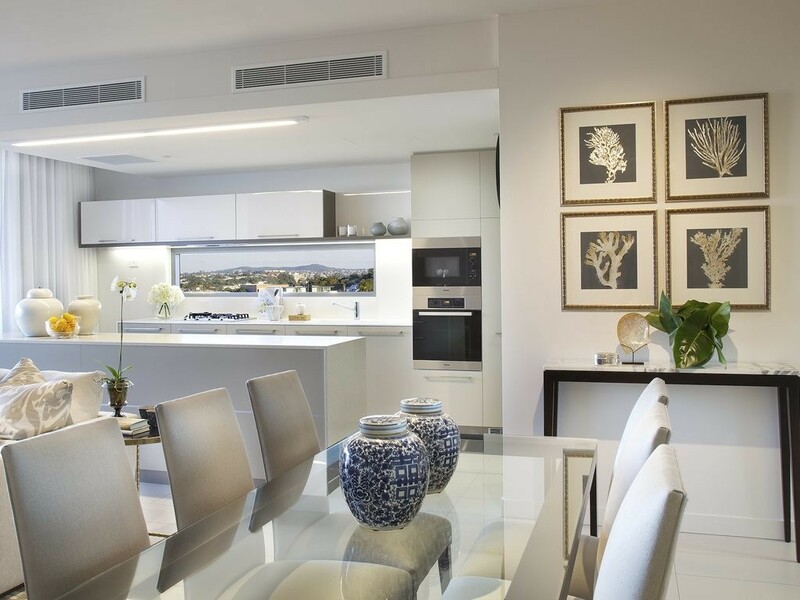 Believing that air-conditioning is a luxury Australians can and should do without, they are instead choosing to focus their efforts – and money – on good passive apartment design to keep homes cool during hot summer days. Breathe Architecture is perhaps the most notable of this bunch. Architects at the practice employed a dematerialisation and reduction strategy for The Commons, a mixed-use building in Brunswick, Melbourne that swept up a host of design and sustainable building awards after completion. Rejecting air-conditioning in all 24 of its units, the project proved that multi-residential buildings designed to be more thermally efficient than usual could moderate the internal temperatures of each home, and keep occupants comfortable in the heat. And it did so by building on common strategies, such as ramping up insulation, and specifying well-performing windows (double glazed with thermal breaks). This ethos of reduction, and the belief that homes do not need AC to stay comfortable, is also evident in the Nightingale model. Proposed after The Commons’ success, Nightingale Housing brings together like-minded investors, architects, developers and buyers to build affordable, and socially and ecologically sustainable multi-residential homes in the country. Doing away with ACs in these apartments have become an accepted strategy; one that will reduce the carbon footprint of the entire block, and save residents on future running costs. IS IT POSSIBLE TO DESIGN AWAY ACS IN APARTMENTS? “Yes, it is, but it requires careful design of the project,” managing director of Silenceair, Chris Matthews, says. ACs draw heat out of a home, transferring it to the outside air, and is a central part of most buildings’ HVAC strategy. In addition to temperature, ACs can effect changes to the humidity or quality of air in a room or home. Passive ventilation, on the other hand, is a low-maintenance natural system that uses external air movement (wind) and pressure differences to cool and ventilate a room, bringing in fresh, clean air. From an ecological perspective passive ventilation, which relies only on natural forces, clearly beats AC. But this will not stop ACs from continuing to be a feature in Australian apartments, at least for the next decade. Scott Carver architect Hon Diec confirms the gap between what developers prize, and what designers believe in, exists. “As an architect and from a Scott Carver point of view, we always want to push for sustainability. We believe in natural ventilation and its ability to create comfortable living spaces for occupants,” he says. Unfortunately, Diec adds, buyers tend to look for ACs, and that influences project and design briefs. This point is not lost on advocates for thermally efficient, only naturally ventilated homes. The Nightingale Model, for example, is as much designed to be a financial solution to the problems that may come with developer-led projects, as it is a case for environmentally sustainable design. However, Pinson raises some additional points that explain why it may not be feasible for bigger and taller apartment buildings to do away with ACs completely. With the densification of urban centers, and more apartments now being built in ‘brownfield sites’ – in noise corridors, adjacent to arterial roads, railway lines and even airports – noise can be a significant hurdle preventing clients from relying on passive ventilation. “The building codes limit the amount of noise allowed in habitable rooms, such as bedrooms and living rooms. The only way lower noise levels can be maintained is by closing windows, but this leads to loss of ventilation,” Matthews says. One case in point is an apartment building in Wolli Creek, NSW, which sits adjacent to a very busy arterial road and situated a stone’s throw from Sydney airport. According to Matthews, the DA consent conditions of the project required the habitable rooms of the noise-affected apartments to be acoustically sealed at night to allow occupants to sleep without disturbances. This meant operable windows could not be used for ventilation, and the project team decided to specify a Silenceair exhaust ventilation system, using AS 1668.2 to satisfy the ventilation requirements. Silenceair’s vents allow fresh air to circulate freely within a home, while keeping out 85 percent of the noise that would otherwise enter through an open window. “The residents can open the windows for purge ventilation when they want, but when the windows are closed, code compliant ventilation is provided by the Silenceair System,” Matthews explains. While the question about whether apartment buildings in Australia can rely on passive ventilation only continues to be fiercely debated, it is important to note that specifying AC units does not mean an architect or even a developer isn’t interested in sustainability gains. In fact, for many projects, good passive design is still are the forefront of a project team’s mind. The Wentworth Point Marina Square apartments in Sydney are one example of ESD working alongside energy efficient artificial cooling systems. The “climate-controlled apartments” in the project utilise high-performing, low-e, double-glazing glass-only windows that achieve U-values below 3.0. Other passive thermal comfort techniques included R2.5 insulation to external walls; R1.5 or more insulation next to halls, lobbies, lifts, stairwells and plantrooms; R.35 added insulation to external roofs; enclosable winter gardens; flexible shading devices; and large openings for natural ventilation. According to Pinson, who worked on the project, these strategies allowed the project to achieve a 6 Star average NatHERS rating, with 25 percent of the dwellings scoring 7 stars or better. Pinson’s company, Integreco, undertakes NatHERS and BASIX assessments for project teams, and works to help them achieve improved performance outcomes. “To put this into perspective, the BASIX tool can actually allow some Sydney developments to pass with an average as low as 3.5 stars. [The Marina Square] results are well beyond what is required (and what is being built) elsewhere in Sydney,” he explains. Waterfront at Newstead by Mirvac, one of the largest urban renewal projects in southeast Queensland, also utilised a combined passive and artificial cooling strategy for its two Waterfront Pier buildings. Every apartment is individually serviced by a Daikin ducted VRV split system, and features separate in-ceiling fan coil units in each bedroom and living room. Each unit is also fitted with Daikin control units, which paves the way for individual room temperature control. This system puts the burden of maintenance and usage costs on the homeowner, with the argument being that this could help reduce overall building energy use. Good passive design strategies can go to waste. Building occupants may choose not to, or not know how to, make the most of an energy efficient home. “One way to look at artificial cooling is that the end user can choose not to use it,” Scott Carver’s Hon Diec points out. “Some people like the convenience of AC, and that kind of mentality is hard to fix. So, while it is important to say ventilation needs to be considered early in design development, and that architects must always take design with the local climate, orientation and site in mind, perhaps what the industry should be doing more of, is teaching.